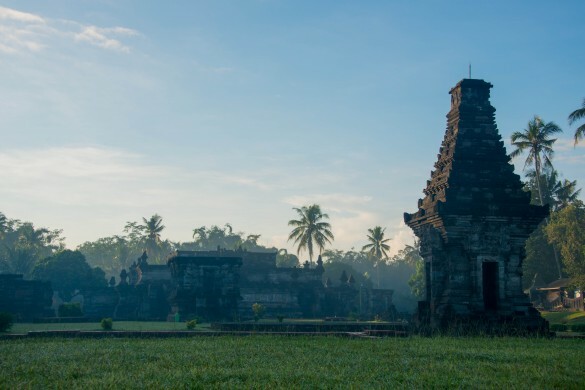 One exquisite structure, the largest ancient Hindu temple in East Java, Candi Penataran, can be found just 12 kilometres from the township of Blitar, and for something totally different you can arrange a candlelight dinner on the grounds of this beautiful temple. Candi Penataran is best appreciated in the evening. It is one of the finest temples in East Java and sits at the foothills of Mount Kelud. By special arrangement, a magical event takes place, and the Hotel Tugu Sri Lestari, Blitar can arrange a ‘Lost Temple Dinner’. It is one of the most unique dining experiences in all of Java, and it’s worth going to Blitar just for this experience. It’s a weekend jaunt from Jakarta. As the sun was setting, I followed a trail of bamboo torches along a winding pathway through the grounds of the grand temple. In front of it a beautiful candlelit table was laid, with a variety of cutlery and glasses to match the seven-course sumptuous meal. As the wine was poured, a lone flutist played a lilting melodic tune, and one felt slowly transported back in time to another place fringed with romance. As the dark sky drew down on this mystical evening, the temple features fell softly into the night. Shadowed by the tall sculptured faces on the walls, hundreds of flickering candles danced in the dusty light. A romantic setting indeed. Blitar is a small, quiet town. It is the birthplace of the first president of Indonesia, President Sukarno (1901–1970). You can visit his childhood house, his tomb and the Sukarno museum, which has an intriguing feature and draws a crowd. At the entrance to the museum, a beautifully framed portrait of Sukarno is on display. This is roped off, and if you stand at the side of the rope and view the painting from this angle, the canvas pulsates at the heart level of the President. There is no draught or air-vent blowing on the painting, and it appears that his heart beats on. At Rambut Monte, a nearby little town, more mystical powers are at play. A beautiful blue-green lake, surrounded by a forest is not only a lovely picnic spot, but there is also a hidden mossy temple to discover. This temple keeps watch over the beautiful lake where a strange event takes place. I saw with my own eyes, strange swirlings on the lakebed, however there did not seem to be anything creating the shifting of sand on the bottom of the lake. It is said to be the home of the Fish God and it is forbidden to swim in this lake; the locals believe that spiritual fish live in the waters. Many people claim to have seen the magic fish or fish gods with skeleton bones and translucent bodies swimming in the lake. Rambut means hair, and it is said in legends that the natural serene beauty of this lake and the surrounding wispy trees resemble the growing hair of the Gods that reside here. Next on the discovery trail, about halfway between Blitar and Malang, you will find an 11th century Ganesha statue. This beautifully preserved statue is carved in the standing position, overlooking the thick jungle and a raging river gorge in the village of Karangkates. The unusual thing about this relic is it is one of the few standing Ganesha statues in Java. Most Ganesha statues assume the sitting pose and no one seems to know why this one is standing. From fish gods to romantic temple dining, Blitar reveals many treasures and can easily be done in a weekend. Why not go somewhere new and discover the beauty of this lesser-known Javanese town and its mystical surrounds? 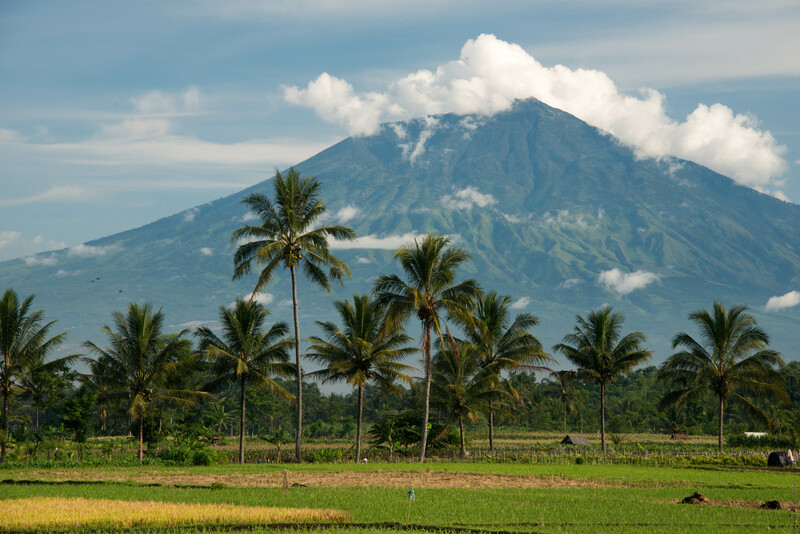 Getting there: Daily flights are available to Malang with Garuda Indonesia, Citilinks, Sriwijaya Air, and Wings. Continue by car for 81.5km to Blitar. 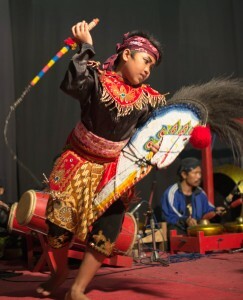 Local Guide and historian: Hery Kurniawan. [email protected]. +62 (0) 81223314594.